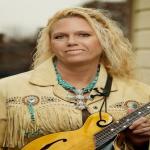 Sign up for Broadjam today to follow Pamela Gray, and be notified when they upload new stuff or update their news! I'm a singer/songwriter/elementary school teacher from Kaufman County Texas , who is the lead singer and mandolin player for the Countrygrass band, Acoustic Sound Hounds. Our music is currently receiving AirPlay on several internet and land-based radio stations. We currently have an album on iTunes, and are working on our second album which will consist of all original material. You can find our upcoming show calendar by liking our page Acoustic Sound Hounds on Facebook. God bless y'all! We have music and materials ready to record our second album, which will consist of all original compositions written by members of Acoustic Sound Hounds. A recent highlight was the opportunity to perform with legendary country singer/songwriter Leona Willliams and Tommy Horton at a private party. Just lovin' and livin' to make a joyful noise!